How to prune fruit trees to create a good structure, keep them in check, help them produce good crops. Notes on winter pruning and summer pruning, how to renovate old fruit trees, and how to remove a tree. Scroll down or click on the links in the interactive index below. Pruning keeps the tree in an optimum energy balance. If you don’t prune, the tree invests a lot of its resources into producing new wood. If you prune, you redirect some of these resources into fruit. Pruning also shapes the trees, enabling the sunlight to reach all the leaves. This increases photosynthesis and makes the tree stronger and healthier. Summer pruning exposes the fruit to light, improving ripening and colour. Pruning has to be done at the right time, in the right way. Don’t forget to visit our YouTube Fruit Tree Channel with hints and tips on pruning for the long term benefit of your fruit trees. Dan Neuteboom of Suffolk Fruit and Trees can provide consultancy on pruning your tree or trees, whatever the variety, rootstock or structure. So often, one comes across apple trees in the prime of their life, being given a “short back and sides” type of pruning. Nothing is more destructive than that sort of treatment, as part of an attempt to keep the tree vigour under control. It will shorten the tree’s productive life and make it a prime target for attack by fungi. 8) Remove unproductive branches on the lower part of the tree, if stem height needs to be increased. 10) Feed the tree organically with regular applications of well-rotted stable manure. However, do make sure this is to the benefit of the tree and not the weeds! There are numerous publications about pruning. All very interesting and very helpful. However my view is that we should tackle the subject of pruning in a different way. First and foremost we need to be able to distinguish clearly between the difference in appearance of a fruit bud and a wood bud. These buds all look different again, if we look for example at shoots and buds either from apple, pear, plum and cherry, or from peach, apricot, nectarine or almond. I believe if we first and foremost learn to differentiate the state of the buds on any type of fruiting tree, then pruning becomes a lot easier and more satisfying. Because the aim of pruning is not the same anywhere and any time. We can set a target, before we lift the secateur, what it is we want to achieve by pruning the tree confronting us. And there are no two people alike, nor are there anywhere two trees alike. We are all individuals, we are all different. The same applies to trees. The only difference is that the tree is silent and passive and we are noisy and active. Therefore, even more reason to think twice before you cut and prune. The second point of importance regarding the way we prune is determined by how the tree has been raised; is it budded, grafted or on its own roots? If it is on its own roots it is likely to be very vigorous. The purpose of grafting or budding the trees on rootstocks, is to bring the tree into production more quickly, and often at the same time finish up with a smaller tree, which is easier from the point of view of picking and tree maintenance. This is a fundamental question for anyone growing fruit in the garden: how do you keep the trees in check, while at the same time keeping them fruitful? The first thing is to protect the trees from spring frosts. As soon as the first flowers are open, it is very important that whenever a spring frost is forecast, the trees are covered before you go to bed with a double layer of garden fleece or the equivalent. By 9 o’clock in the morning, when the temperature has risen above 0 degrees Celsius, the fleece will have to be removed for pollination purposes. The point of all this is that temperatures below 0°C kill the flowers, which in turn prevents fruit from being formed. This may sound like quite a lot of work to incorporate into your busy daily schedule. In actual fact it doesn’t take long and it can be quite easily done, on one condition: as long the trees are of a size not much taller than say approximately 8 feet. THIS CAN ONLY BE ACHIEVED IF SUMMER PRUNING IS CARRIED OUT. Winter pruning increases tree size, summer pruning maintains tree size to the height and width you like it to be, without the tree losing its ability to crop the following year. The important point to remember is that timing is of critical importance. As a general guide, summer pruning should be done as soon as the tree has been picked. Definitely no later than the end of September. Once leaf quality is starting to deteriorate, it is too late. Remove the older wood. Retain the fruiting spurs and the younger wood, and the two-year-old short darts. Always seal the wounds with “Heal and Seal”, obtainable from garden centres. Not all varieties can be summer pruned in this way. Considering pear trees, the variety range suitable for this treatment is Concorde, Conference, Onward, Williams and Beth. Quite a lot of apple varieties are suitable, but only diploid varieties. such as James Grieve, Red Windsor, Egremont Russet, Katy and Sunset. Triploids are usually too vigorous to be kept in control in this way. 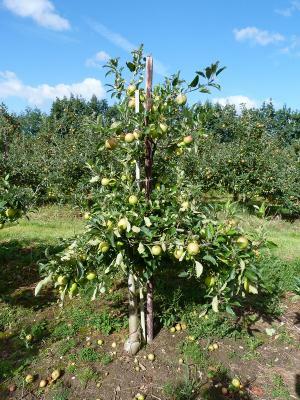 With tip bearers such as Worcester Pearmain, keeping size under control by summer pruning is possible but tricky, and with shy-bearing varieties such as Cox Orange Pippin, it is an uphill struggle. Therefore always seek advice. After all, fruit trees, all being well, should be a satisfying long-term investment. Similarly seek advice when you are considering cherries and plum varieties. A dwarf stock is a help in controlling tree size, on good soils. On shallow soils, this is often not the case. A raised bed is a better alternative than planting in a poor soil. Lastly, never let your trees dry out. Water weekly during the growing season. Do not flood the trees; one full watering can per week for each tree is enough. Do not starve your trees by planting in a bed of grass and weeds. The trees will dry out in no time!! Secondly, one needs to be fully aware of the annual growth cycle of fruit trees and fruiting plants. First, let us look at the growth cycle of fruit trees. Fruit trees can reach a high age and display a certain rhythm of different growth patterns each year. It is very important to understand the logical stages of growth development. Let me explain. When winter has passed and early signs of spring have arrived, the fruit trees are beginning to wake up from their long winter sleep, known as the “dormant period.” Therefore when dormancy is coming to an end, the first growth cycle begins. The end of the dormancy phase is at different times for the various tree groups; the trees of Group 3 wake up first, around the end of February. Group 2 around the middle of March, Group 1 around the end of March. There are no set dates as such. Sometimes the season is early, sometimes late, mainly influenced by the preceding weather patterns and in particular the temperature. How can one influence tree growth, if we have plenty of room and therefore have as a priority, the rapid expansion of tree volume? In this case we must make sure the trees have been budded or grafted onto a semi vigorous or a vigorous rootstock. The rootstock MM106 is in most cases the right choice. However strong the rootstock, if the young trees have to fight against a dense cover of weeds and grass, then in many cases the tree’s performance is held back. Too much energy is wasted battling with the weeds to find enough moisture to achieve rapid growth. Without sufficient soil moisture, growth comes to a complete standstill. The same applies if livestock is allowed to push the trees about and thereby loosen the roots, due to the absence of adequately strong and tall enough tree guards. Another increasing problem due to high levels of unemployment is youth vandalism. In that case it is essential that the tree guards are of such a construction and design, to form an effective barrier to protect the trees and its main framework of branches from being vandalised. The other aspect is nutrition. Strong tree growth is hampered if nitrogen is not readily available. In advance of the planting of the trees, a good supply of well-rotted farmyard manure should be incorporated in the soil. 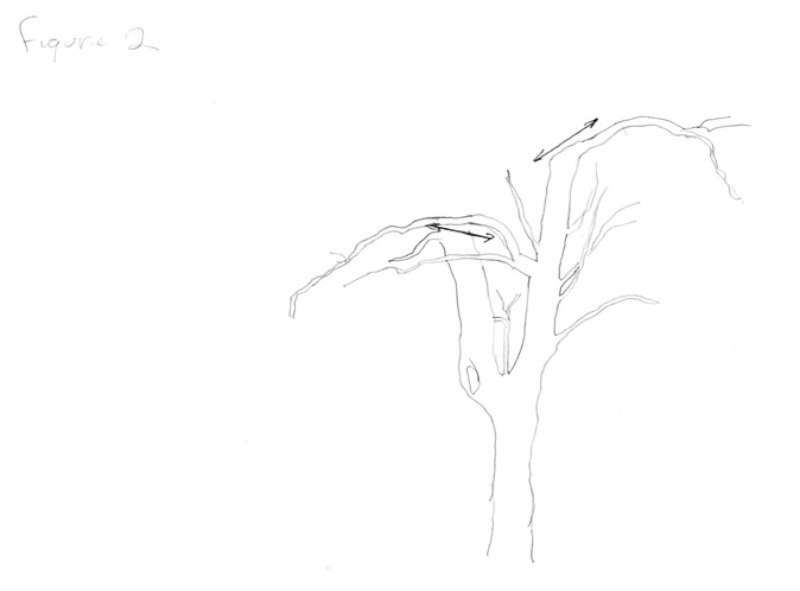 10) the position of the branch as regards light intensity. This, I realize, is quite a list. However if one is interested in the subject of growing fruit, a lot of those points are plain common sense. Here are some straightforward recommendations. 1) Bring them into cropping by not pruning in, except for the leader. 2) Tie branches down; high branches under the leader slightly below horizontal, in the middle of the tree horizontal, in the bottom of the tree slightly upwards. 3) In the case of an orchard, have fairly wide grass strips down the middle of the alleyways. 1) Cut into the one year old shoots. 2) Prune early in the winter. 3) Tie up essential framework branches, where necessary. 4) Make sure the trees are not short of water. 5) Don’t overburden the tree with lots of fruit. 1) Prune the trees as soon as picking has been completed. 2) Maintain thick branches in the bottom of the trees. 3) Cut out all thick branches in the top of the tree. 4) Restore a triangular shape to the canopy of the tree. 5) The following winter, do not prune at all. 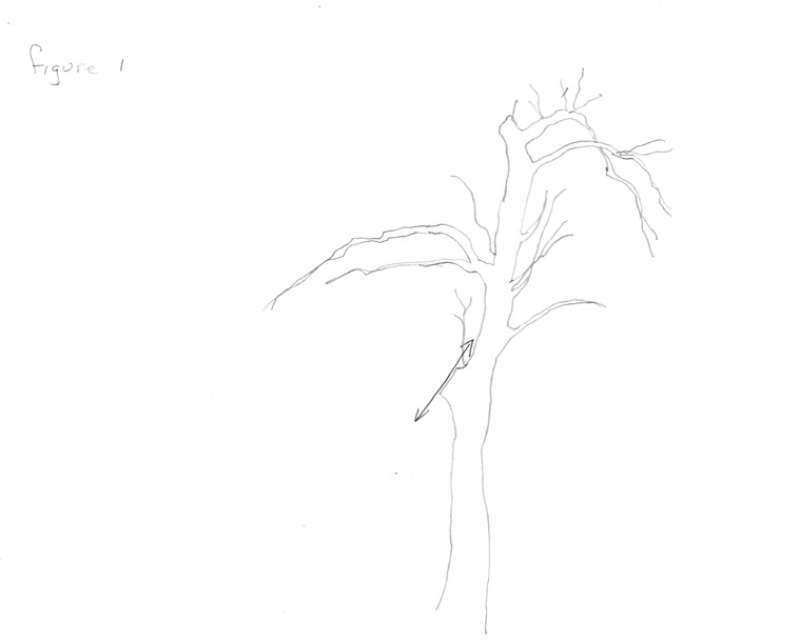 6) Encourage the tree to crop, as outlined above. 1) Winter pruning stimulates more growth. 2) Winter pruning reduces cropping. 3) Winter pruning stimulates root growth. 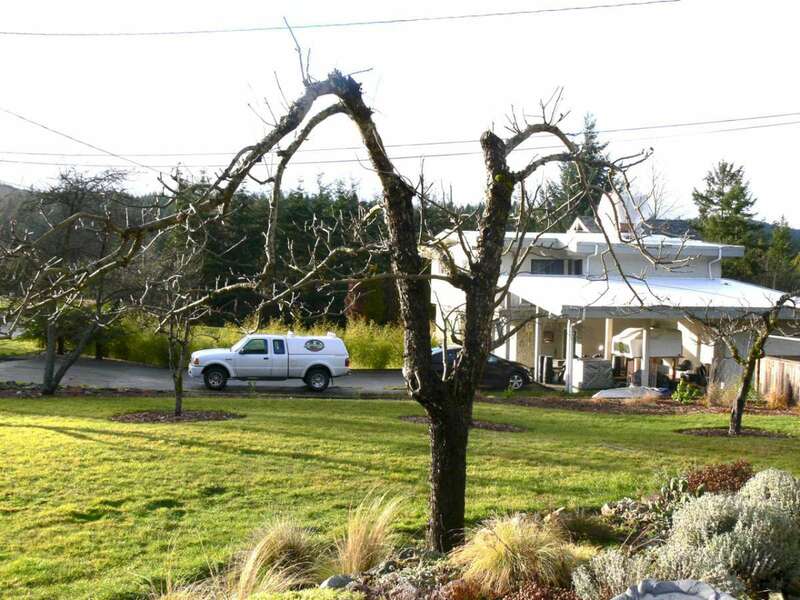 4) Winter pruning produces larger trees. 1) Essential tool for containment of tree size. 2) Essential for extra fruit bud formation. 3) Essential for diverting energy to fruit growth. 4) Essential for regular cropping. 1) Winter pruning encourages essential replacement shoots. 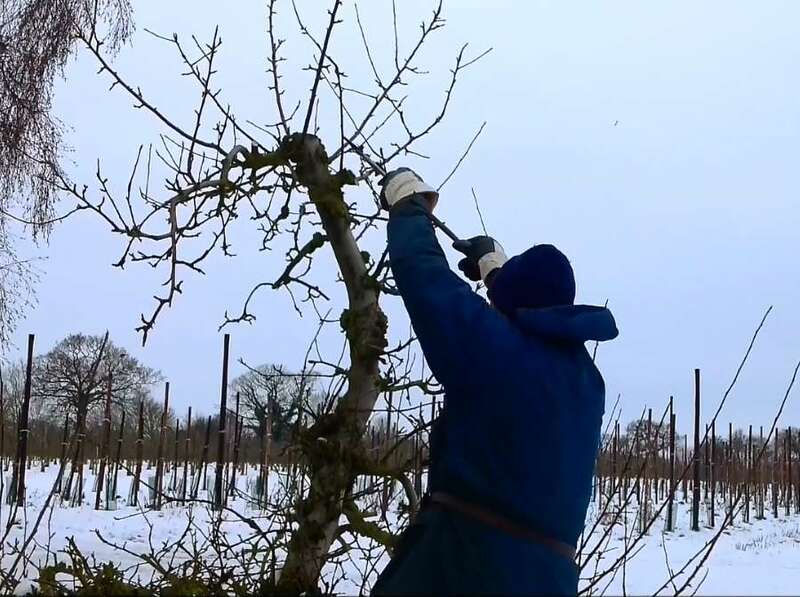 2) Winter pruning regulates crop yield and fruit size. 3) Winter pruning strengthens root systems. 4) Winter pruning maintains desired tree size. 1) Essential to keep tree structure open to sunlight. 2) Essential to avoid overcropping. 3) Essential to create healthy spurs and darts. 4) Essential to maintain tree vitality. It may sound drastic, but poorly-cropping plum trees often react very favourably to a treatment as set out below. This method must be seen as a last resort. Obviously improving microclimate and pollination are absolutely essential as methods to be tried first. 1) first week of June: remove growth points of strongly growing new shoots. 2) first week of July: cut back to five-leaf stage and remove growth points. 3) first week of August: cut out small surplus branches. 5) When leaf fall is complete: lift tree, cut roots and plant back in the same hole. Stake and tie the tree to stop rocking movements while roots regrow. 1) Remove growth points as above. 2) First week of September: carry out summer pruning programme. 3) Do not prune during the winter months. 2) Too much winter pruning, causing lack of fruitbud formation. 4) Lack of pollinating insects. 5) Poor light due to overcrowding. 7) Too cold during flowering time; as a result flowers abort and fruit set fails to materialize. Fruit trees are a wonderful investment. If looked after well, trees will continue to crop year after year, even when the trees are 30 to 40 years old. But what about a situation in which you have just moved house and you’ve found a totally neglected fruit tree in the new garden? What should be done? If it turns out that the tree is cropping well, restrict the pruning to cutting out dead wood and crossing branches in the first year. The next year do a little more and improve the light entrance into the centre of the tree. Without good light the fruit tree is unable to make good fruit bud. On no account try to remodel the tree all in one year. Old fruit trees do best when you bring on improvements gradually. In my experience an old tree reacts very favourably if 4 or 5 large branches are taken out rather than lots of little snips here and there. Neglected trees will usually show lots of dense drooping fruiting wood totally overgrown by younger wood, which makes it all very dark and overcrowded. Over a number of years, gradually take out all wood which creates layer upon layer, in and around the canopy. The timing to do this job is also important. In order to reduce fungal infections to a minimum, choose a nice warm day in the July/August period rather than a period when the tree is without leaves and the healing of the wounds takes a long time. You can bring the height of the tree down, provided this is done gradually over a number of years. This operation should be carried out any time in August towards the end of the summer. NEVER during the winter months. Always seal large wounds with either Arbrex or Heal and Seal or similar wood healing compounds. If after 3 or 4 years you can throw your hat through the trees without the hat getting hooked up anywhere you will have done a great job. The old fruit tree will start a new lease in life and will thank you for it by producing wonderful fruits. Often we hear the comment, “I have an old pear tree and an apple tree, but neither seem to do any good.” Let’s compare a tree to ourselves. If we don’t take care of ourselves and never go outside if and when we can, we gradually accumulate all sorts of problems too. You may say, what has that got to do with my fruit trees? Surely they are outside all the time? It’s all to do with light. It does us humans good to be in the sunshine, and the same applies to fruit trees, in the sense that they need good light throughout. If the trees have been left to themselves and have produced masses of shoots all round, virtually a solid mass of growth that creates darkness inside the canopy of the tree, then the leaves are no longer able to carry out the functions they were designed for. Photosynthesis goes into survival mode: the little energy that the shaded leaves manage to produce is used simply to keep the structure alive. There is no energy left to create productive fruiting wood as a replacement for older non-productive branches. In this situation, the best way to attain a complete reversal is not by removing lots of little bits of wood, but by opening the tree right up by removing four or five large branches, so that the sunshine can penetrate into the centre of the tree. Seal the wounds with Arbrex, feed the tree with organic matter, water the tree in dry periods and you will be amazed at the results. Be patient and give the tree at least two years to mend its ways. We received an enquiry from a reader who has an apple tree with a double trunk. This is how she described the problem. 1) Remove the second trunk. Timing is important! Remove it during the 2nd or 3rd week of August and not before. 2) Seal the wound with Arbrex or Heal and Seal, obtainable online or from a good garden centre. 3) The trunk which is left with the good branches should not be pruned the following winter. The tree will then be resettled. “I would like to ask for further clarification. The tree and the others have experienced the stress of reduction of size (no more than a third each year for four years) plus a recent drought and one season of a severe infestation of tent caterpillars. This tree is unfortunately placed in front of my house, so the appearance is a priority with this specific tree. “Second, I need to be able to prune these trees myself, and am trying to take this tree permanently lower overall by about 12-18 inches. I could reach the top then with less risk that I will fall off the ladder. Another reason the tree is oddly shaped is because the deer raid this tree from both levels. “Your suggestions make good sense to me, but I would like to ask if because the tree has been stressed four years in a row, would it be less traumatic if I took off only part of the selected trunk, plus one top branch of the preferred trunk this year, and then remove the full selected trunk one year later?” This possible gentler approach is shown in the diagram below. Certainly the gentler approach is fine. However now I have seen the state of the tree, I am quite sure the tree is suffering of malnutrition! Ideally it would need, on a 2 square metre area around the trunk, the application of quality manure, ideally organic chicken manure (such as Super Dug), dried and stabilized. This will feed the tree over a 6-month period. Secondly WATER on a weekly basis as soon as rain fall is lacking. Extra feeding without watering is useless!! Finally the lower part of the trunk looks in a poor state. The vascular system has been damaged. To help the tree to overcome this problem, it will need to make new cambium cells in the outer layers of the trunk. Wrapping the lower part of the trunk with a wide enough black plastic “waste bag” will do the trick. Summarising; regular watering plus organic feeding plus tree trunk care will be a positive way to proceed. None of us would ever want to cut down a fruit tree, but sometimes it has to be done. For example, if you planted a fruit tree on a vigorous stock and it has grown too large for your garden. Sometimes in this situation, there is no way to tame the tree. In this sort of situation, it is best to grub the tree and plant one or two new trees on a dwarf stock. So the problem is: how do you remove the tree from your garden? It is actually very simple. It does not require any complicated procedures. However to be successful the following points need to be carried out properly, from late July to September, and on a dry day, when no rain is expected. 1) With a chainsaw the tree trunk needs to be cut off at ground level. 2) Within the next hour the stump needs to be painted with a liquid called “STUMPKILLER”, using an ordinary painter’s brush. This is a product available in any good garden centre. It is usually based on the totally harmless weed killer called Round Up, which is a chemical formulation containing glyphosphate. It should be used at the full concentration, and NOT the diluted version. 3) Any woody suckers coming up from the ground underneath the tree need to be treated in the same manner. No digging up of the soil or removing stumps from the ground is necessary. If the above procedure is followed, the tree stump will immediately die and the chemical used will be neutralized as soon as it hits the soil, via the stump on which it has been applied. We carry out tree removal on our farm on an annual basis, with 100% success. Why does it have to be done from late July to September? Because at this time of year, the tree is preparing for dormancy. Carbohydrates produced in the leaves by photosynthesis are being transported down into the root system where they will be stored during the winter. So if you cut your tree down now, and apply the stump killer, the chemical will immediately be sucked in and brought down to the roots, causing the stump to die immediately.